What is your main spec? Do you mind changing them if required? What spec/weapons perks are you using and why? Rushed for Armies of the Damned and Portal to the Underworld for the debuffs that they give enemies that increase both my AoE and ST dps, and on the way tried to go for the perks that increase Festering Strike damage, Virulent Plague damage etc. All of my main attacks, as well as taking Bursting Sores, Pestilent Pustules ,Castigator and Soul Reaper to make my Festering Wounds hit much harder and to drastically increase the potency of Apocalypse in general. How is your gear? Comment on your current gear. Mention any offspec gear you have. At the time of writing this, 840 Unholy, 839 Blood, I've been stacking Crit and Haste, Haste because of rune/runic power regen, attack speed to tunnel in more Death Coils for Scourge of Worlds as well as getting 8 Festering Wounds on a target ASAP to maximize damage output, and Crit because I took Castigator, which on crits makes the Festering Wound system hit twice as hard. I also have a lot of mastery (44%) for the shadow damage, but i ain't focusing on it. 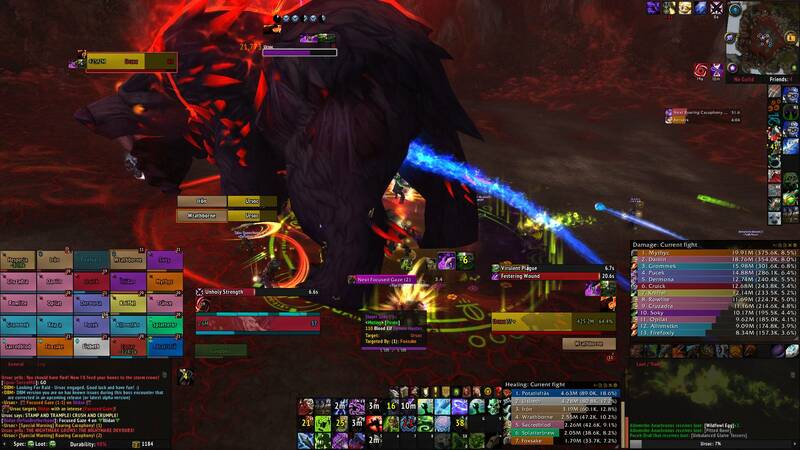 What is your experience in end game raid instances? Include vanilla until current instance experience if applicable. Include also all experience in Hardmodes/Mythic. How often do you play World of Warcraft? On what times and days of the week are you usually online? Usually the evenings of almost everyday, hardly ever in the day due to College and Work. What guild(s) have you been in before applying, and why did you leave them? Do you agree to use Discord/Teamspeak and have a Microphone/Headset, and are you able and comfortable with talking during raids? Can't stand doing group content without VOIP to be honest, so for me it's actually a necessity. Explain your choice of key bindings, do not list them all, just give us an idea of which abilities you bind where. Do you have any healing / damage logs from a previous raid? If so please post a link below. Tell us a joke, it's (hopefully) been a long application and we need a laugh. You look like a smart, capable guy, feel free to contact me in-game for an invite. You can consider leveling up or transferring another character too since we're at the beginning and won't have a full team for 1-2 weeks.